Cherry Mobile again released their latest quad core Android smartphone to welcome this New Year. Guess what guys this new handset is named again as Flare again but this time its 2.1 carrying the same price tag like the very first CM Flare. If you’re looking to upgrade your phone then try to take a look its features and specs then consider this on your wish list. This is an addition to Cherry Mobile Flare series and I’m sure you already know how users appreciate and expect about this phone aside from the affordable price. From ‘Dual Core ng Bayan’ to ‘Quad Core ng Bayan’ Cherry Mobile again gives you the possible best option you can get on a smartphone. With the same 4.0 inch capacitive touch screen, Flare 2.1 is now on IPS display on 480x800 resolution. This is another good feature added on this series since the first Flare release. To those who are asking about multi touch support on this device we’ll just update this post as soon as we gathered more information on this phone. When it comes to processing this device is powered up with quad core processor clocked at 1.2GHz supported by 1GB RAM amount. Again this is another good feature you can get with Flare 2.1 and not only this version but same with other Flare handset like Flare S. To be specific with its power it runs on a Qualcomm MSm8225Q chipset. Camera features for this handset is only 5 megapixels on the rear side that come with LED flash and VGA on the front side. If you’re satisfied with the previous Flare camera, quality is just the same and you can still consider this phone as your ‘picture2x’ buddy. 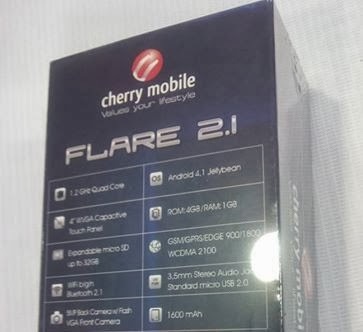 For battery details, Cherry Mobile Flare 2.1 has 1600mAh power that could last a day on light usage. Battery power duration may vary depending on the task you throw on this handset, if you’re more on games and streaming videos then duration maybe lessen but if you’re just up with call text and few hours of browsing then expect it to last longer. Other things to consider when talking about battery life are the display and the chipset of the phone. Last is the price, again you can’t complain with it’s given amount as it only cost you 3,999 pesos to own a Flare 2.1 quad core phone with Jellybean 4.1 OS. You may find quick specifications below for your reference. how many finger does the multi touch support ?